Friday nights are most people's most awaited night of the week. Why? It's the night to let loose and forget about the stress bring about by deadlines and hard-to-please bosses! For at least two days, you will be free from your usual routine of work, eat, sleep. So why not celebrate the night with some drinking party games we have summed up for you? 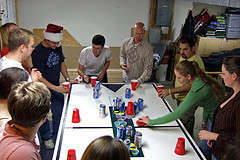 No doubt that Ultimate Beer Pong's popularity among drinkers is brought by how much fun the game brings to a party. Search the Internet and you'll be surprised that it is the preferred game among drinking games or ask any drinker and I am sure that he/she will be able to tell you that they have played it even once since they started drinking. The mechanics of the game is very simple and even a drunk man can play this. Fill twelve cups with beer or any alcoholic drink. Grab two ping pong or any similarly sized balls. Choose a table where all of you can comfortably play the game. The cups of beer are placed on opposing sides of the table, wherein both groups are also positioned to shoot their balls on their opponent's cups. Every ball that gets into a cup, one member of the losing team will be required to drink from that cup. The first team to consume all their cups losses the game! People who really, really wanted to get those stress accumulated throughout the week should play drinking party games like Pass The Pitcher. You ask why? In this game, a person is to drink directly from the pitcher, he or she has the freedom to either drink too much or just a little from it. He/she just need to be wary not leave behind something when the pitcher is about to be empty as the consequence of this game is that the next pitcher will be bought by the person before the last drinker. This game if also perfect for those who wanted to get drunk and pay nothing at all! It also gets exciting and thrilling as you watch each player when they examine if they can drink the whole pitcher or not! Best played in bars or when you have a large group of friends, it requires teams of at least four members. 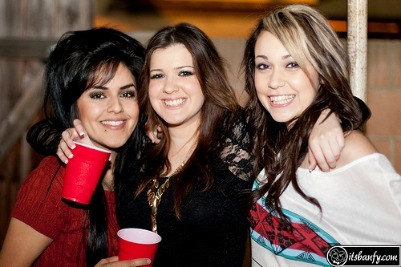 A half-cup of beer or two shoots of liquor can be placed on each cup. This game is played by flipping the cups upside-down as soon as a player finished his/her drink. Having successfully flip the cup is needed before the next member gets his turn and the first team to finish this relay race, wins! Let's celebrate the good work you have done for the week - may it be appreciated by your boss or not. But, don't let that get you down as your hard work truly deserves these drinking party games! As for the moment, leave every work stuff at the office and appreciate the fact that you will not be seeing him or her until Monday comes over!